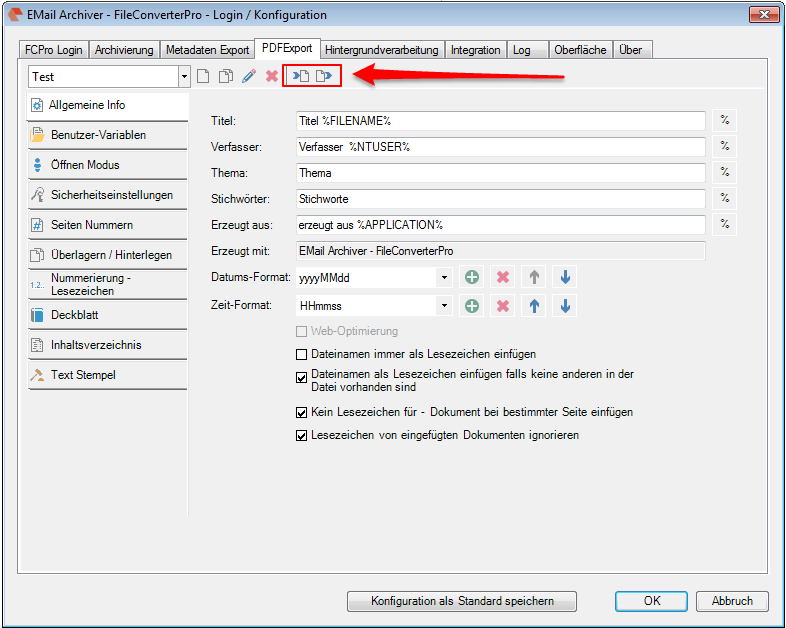 Import & Export of all PDF export settings: All configuration settings of the rather extensive PDF Export Settings can now be exported and re-imported as * .gfix (= zip) file. Not only the settings are packed into this file, but also all associated external PDF, DOC and TOC files. So it is easily possible to exchange the complete configuration of this function between different applications and computers or create configurations once and then distribute. We will add these import / export function also for FileConverterPro . UAnd in further consequence it will also be a PDF export editor with which you can write, read and edit such files independently. For testing, the hosted FileConverter Pro Testserver vcan be used – this is already set after installing the Email Archiver.